Lençois Maranhenses is undoubtedly one of the most beautiful places in the world. It is an immense mass of sand and fresh water, constantly changing under the intense action of the wind. It’s almost like a living being, which makes it even more magical. Its dunes and lagoons do not stop moving, covering forests, houses and whatever else lies ahead of it. It occupies an area of ​​approximately 60 by 20 kilometers, being the north side against in the sea, and the other boarders are marked by vegetation and rivers. It constitutes the Lençois Maranhenses National Park. That infinite labyrinth of dunes and lagoons, created by the east trade winds, is a true paradise for kitesurfing. The water in the lagoons is crystal clear and even drinkable. That’s right, one can drink it without fear, it comes directly from the water table. The access points basically stem from 3 cities: Barreirinhas, Atins and Santo Amaro. Atins, by itself is already a great paradise for kiting. 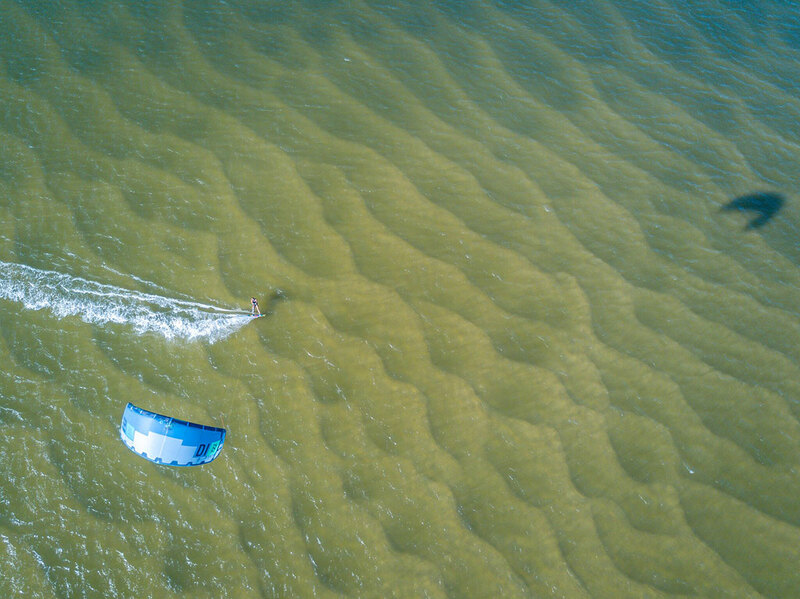 Located at the mouth of the Preguiça River, the site offers several different kiting conditions: some totally flat areas, where you can leisurely kite to some sandbars, an area with good waves for the kitewave, and for hydrofoil lovers, pass through the Rio Preguiça for 7 kilometers against the wind, until Caburé, a unique and unforgettable kiting experience. However, Atins is not exactly the Lençois Maranhenses, it is located in the part of the vegetation, in the extreme northeast of Lençois. From there, you’re able to get in a accredited vehicle and tour around inside the park, visit some paradisiac lagoons, and go for a kiting session. 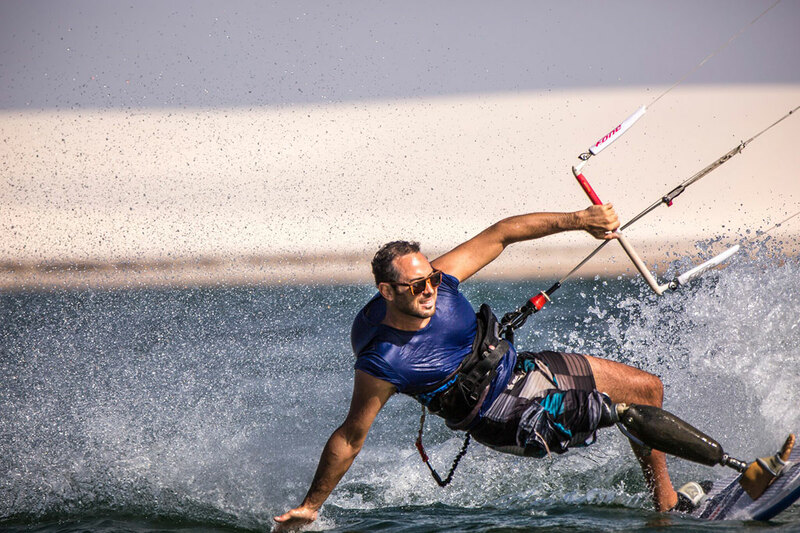 For the more fissured, it is possible to continue kiting through the sea for a 25 kilometers downwind, jump into a car, and continue kiting in the lagoons. The largest ponds in the park are located in the western part of Lençois, near Santo Amaro. It is undoubtedly the best sector for those who are most interested in the lagoons. Access is always done with accredited vehicles. How was the Lencois Maranhenses formed? Where does all that sand world come from? There is the theory that it comes from the Parnaiba River, far from the coast. The river brings that sand from the interior of the country, for hundreds of kilometers, and empties it into the sea. 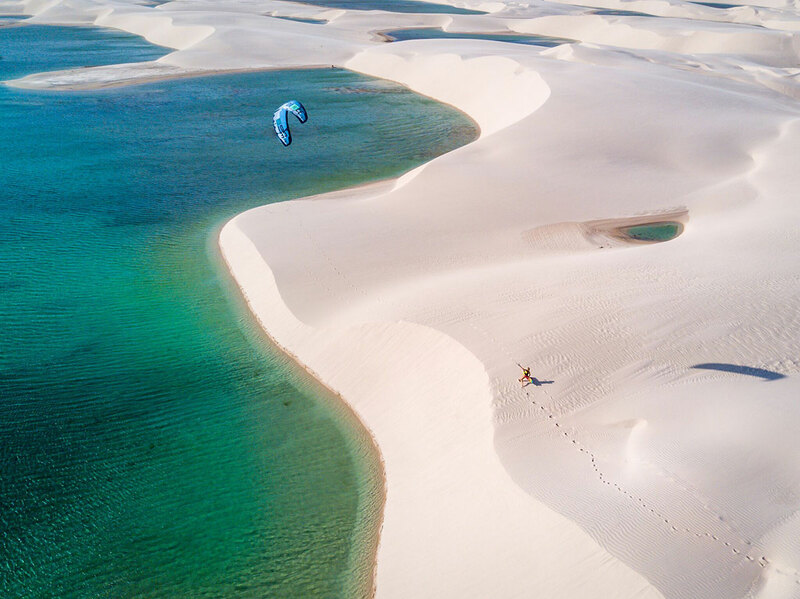 The east winds and the ocean current carry the sand toward the west, and it is deposited in the smaller Lençois (a smaller version, between Tutóia and Paulino Neves), and Lençois Maranhenses. It can be observed that this sand is different from the sand found east of the river Parnaíba (Piauí and Ceará), it is whiter and thinner. And the wind moves those dunes at an impressive speed. In the middle of that immense desert of sand and water, there are 2 oasis: they are places where we find vegetation, forest, and some families of native inhabitants. The names are: Baixa Grande, and Queimada dos Britos. Residents currently live off of the tourism. Besides the natives, who have special authorization to travel by car, it is only allowed to walk to these areas. There is a traditional hiking route that runs through the park in 3 days, staying overnight in each oasis. It is an unforgettable experience, and incredible as it may seem, is more frequently visited by foreigners than Brazilians. Some people cross the park by kite. They take the fins off of the boards, and become true amphibians, alternating kiting from the lagoons to the dunes. That’s right, kiting all over the dunes, crossing lagoons, and continuing for miles in that surreal, wind-driven scenery. But don’t think it’s easy, kiting in the sand is for the few! There have been 2 editions of the Red Bull Rally of the Winds championship, which consists of a kite race, part by sea, and part by the dunes and lagoons. Competitors should do their research to find the best path, which offers the best lagoons, and to avoid sand stretches as much as possible. Some competitors kite on the sand, others prefer to run carrying the board. In both of the 2 championships, the winner was Alex Neto, from Cumbuco. 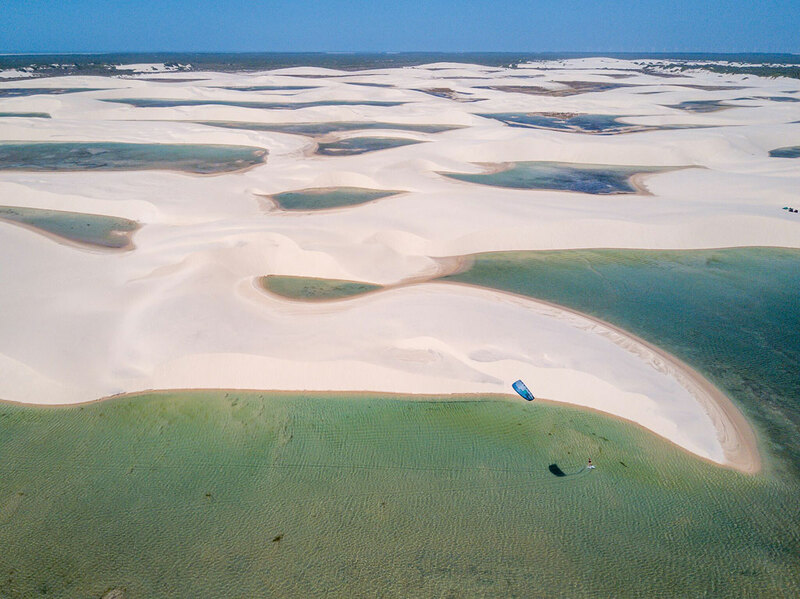 If you are thinking about kiting in the Lençois Maranhenses, think a little further. This great masterpiece of nature deserves to be contemplated with affection. Take it easy, breathe, and enjoy. Watch the sunset from the dunes, observe the curves and the beautiful colors. Take a moment of silence, and connect. Your soul will be grateful!